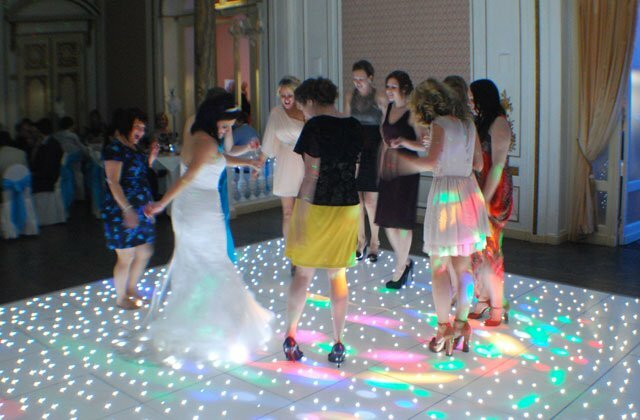 We offer four types of dance floors, the most popular is the white starlit LED Dance Floor with either black or white background, we also offer the white floor with with multi-colour changing LED’s. These are very similar to the white one in the photo, but the LED’s can be programmed to twinkle in nearly every colour in the rainbow. All of our floors are perfect for both wedding receptions and corporate events. Our NEW multi-colored LED Floor has a superb glossy white finish and the LEDs are fully programmable to change to your color theme or allow then LED’s to fade from one color to another. The speed of the light change can also be controlled to your preference. The forth floor is our video floor which can be built up to 20ft by 20ft and and can display any image as it would on a TV. You should consider Led dance floor hire when planning a wedding as the floors really do look incredible, and will provided the most amazing back drop for your 1st dance photographs. All our dance floors use a special locking system which ensures that pieces don’t come loose during use. The floors are able to withstand being danced on by even the largest of guests. For health and safety reasons we do ask guests not to take drinks onto the dance floors. 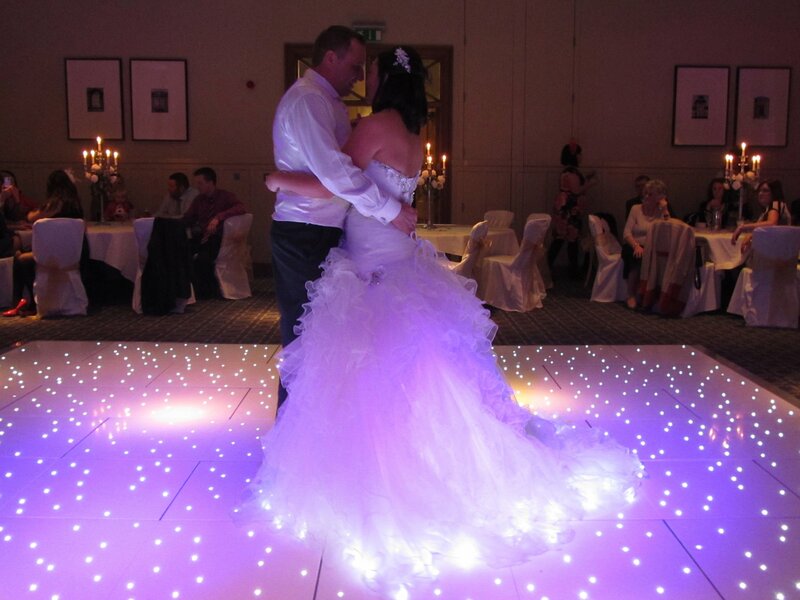 The starlit dance floors have hundreds of LED’s built into them which allow it to produce a twinkling effect. The floor requires a minimal amount of electricity because it uses LED’s, so is suitable for both marquees and traditional wedding venues. We simply require one 13amp plug socket. Our fully trained staff will deliver, set up and remove the dance floor after the event so you don’t have to worry about a thing. During installation we will also fit polished aluminium edging so that your guests can step on and off with ease (it is the same height as a traditional wooden dance floor). We do require around an hour to install the floor, but please discuss your requirements in advance as we can sometimes complete installation in advance of your function. We remain confident that our rates are the lowest in the region, and we offer even better packages when using our disco services. These dance floors are guaranteed to wow your guests and along with our entertainment you will not be disappointed. **Please be aware that we require a deposit of £50.00 when booking the LED Dance Floors and Photo Booths, with the remainder balance to be paid 7 days before your hire date.